The Zig Zag Railway is a charming and unusual line. Its home is in the Blue Mountains, a little less than two hours northwest of Sydney, New South Wales, Australia. The Zig Zag was part of a railway built between 1866 and 1869 to carry produce from farmlands west of the Blue Mountains to Sydney, and to transport coal and iron mined around Lithgow. The part of the original line that is in use today as a tourist railway is the zig zag portion that climbs back and forth through tunnels, across handsome sandstone viaducts, from switchback to switchback, to carry passengers from the valley to the mountain top. Because of the switchbacks during the train's climb up or down, passengers exit from the coaches at the end of each section and watch the engine uncouple and run around to the other end of the train to pull it the opposite direction over the next section. It is entertaining to watch. The Blue Mountains are pretty and the entire experience is fun. We even saw kangaroos along the tracks. In 2013, a devastating fire destroyed buildings, some rolling stock, and equipment used to service rolling stock. The railway is currently closed, while they raise funds and rebuild. The operators hope to resume passenger service in late 2017. 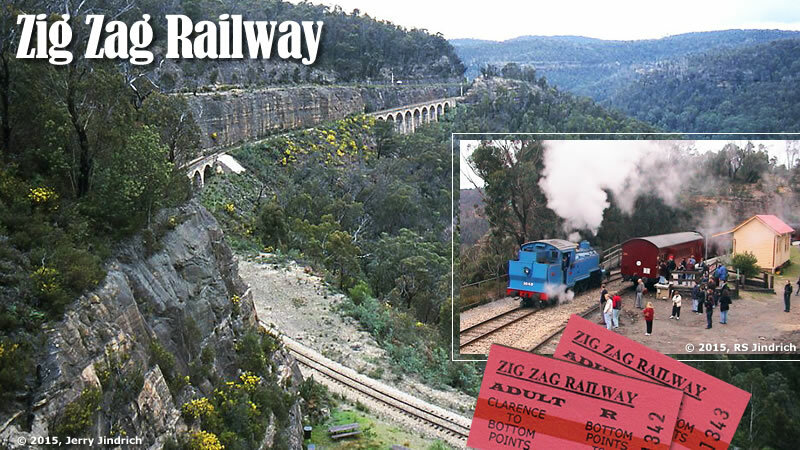 The large photo at the top of the page captures two of the Zig Zag Railway viaducts and gives a view of the Blue Mountains. The smaller image above and the four pictures below show our locomotive uncoupling from one end of the train and moving to the other end for the next stage of the journey. There are similar railways around the world that zig and zag to climb steep grades. The Cass Railroad (pictured below) was built in 1901 to haul lumber to a sawmill in the town of Cass, West Virginia, USA. Tourist trains follow the same winding and steep route through the forested mountains, pulled and pushed by carefully restored Shay engines. The Shay locomotives were heavy and used pistons and gears to apply power to all of their driving wheels, thus providing extraordinary traction. We recommend both the Zig Zag Railway and the Cass Scenic Railroad. In neither case, do you travel far, but "getting there" is exciting and fun.